Swedish proverb: God gives every bird a worm, but he does not throw it into the nest. Richard D. Brinkman on Fri, 06/27/2008 - 5:56pm. Thank you for pointing out this article. It's difficult to attribute Mr. Babiak's column simply to irresponsible journalism. Mr. Babiak has researched the subject enough to list six media celebrities who have criticized the official account of 9/11. 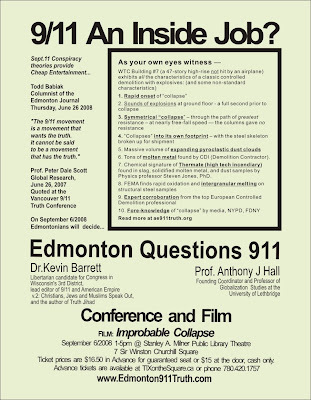 His failure to mention any of the hundreds of credible critics of the official account of 9/11 from the military, intelligence services, law enforcement, government, professional architects and engineers, pilots, professors and others, whom he must have also discovered in his research, leads one to believe Mr. Babiak is intentionally trying to mislead and manipulate his readers. Why doesn't Mr. Babiak mention the former Commanding General of U.S. Army Intelligence or the former Chairman of the CIA's National Intelligence Estimates, both of whom do not accept the official account? Surely their opinion on matters of terrorism and national security are much more relevant than actors and singers. 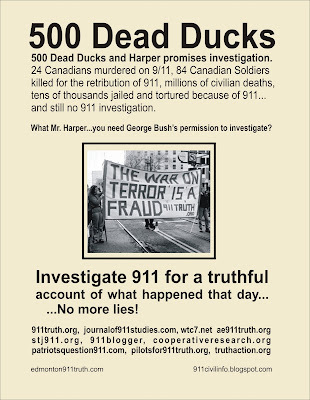 Mr. Babiak's further failure to mention that the former President of Italy, the former Secretary of the Federal Ministry of Defense of West Germany, two former UK Cabinet Ministers, and many, many others also reject the official account of 9/11 proves his total lack of objectivity or credibility on the subject of 9/11. Alan Miller on Fri, 06/27/2008 - 8:10pm.